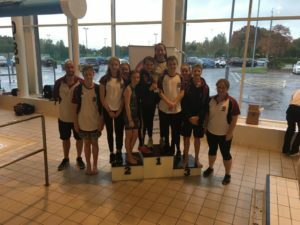 A big well done to all the swimmers who competed at our own Premier Meet at Bathgate on the 6th and 7th October. An excellent team performance saw us lift the Top Club Trophy at the end of the weekend, and Kate C, Holly L, Rowan S and Jack B pick up the Top Girl / Boy awards in their respective age groups. Thanks also to all the parent who came along. It was fantastic to see so many from the club helping and also donating the many prizes for our Raffle/Tombola. The net profit was around £6,300 and this sum will help with the running of the club.